Three ways to talk to us! 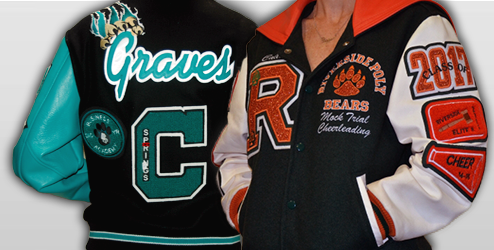 Our company is committed to manufacturing on site, one-of-a-kind letterman's jackets. Each school jacket is personally customized according to sizing preferences and design. Our sports jackets are constructed with 80% virgin wool, 20% nylon for added durability, and 100% genuine cowhide leather. In addition, we cover all inside embroidery stitches with black nylon lining and provide one inside pocket for extra storage. Chenille patches are manufactured on site. Design of each patch is limited solely by your imagination. Our sales representatives can assist you with creating a patch or you can design one online. JL Custom Jackets is the only licensed manufacturer of all CIF Southern Section Champions patches. Your options include ordering the standardized CIF patch for your sport or adding your personal touch by altering the patch on the CIF patch site. Whether you fax, e-mail your order or build your CIF patch online, superior quality is our top priority. Click here to get started. Personalized or standard chenille letters can be ordered individually or in quantity. Since school chenille letters are generally standardized, we can mimic any school design because all our letters are manufactured on site. Welcome to our custom patch builder. Whether you are ordering for a team or for one individual, you can create your custom patch by selecting different shapes, colors, emblems and text. Once you are satisfied with the overall layout, orders can be submitted for processing and delivered right to your doorstep. Click on the patch builder to begin! Or click here to begin.